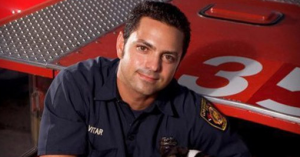 Michael Anthony Vitar, born on the 21st December 1978 in Los Angeles, California USA, is a retired actor and current firefighter, who has worked for the Los Angeles Fire Department since 2002. His career in the entertainment industry was active from 1990 until 1997. Have you ever wondered how rich Mike Vitar is, as of late 2016? According to authoritative sources, it has been estimated that Mike`s net worth is as high as $300,000, earned through his two very different careers. With Cuban roots, Mike grew up in his hometown, alongside his older brother, Pablo and sister Elizabeth. Mike`s acting career began quite unexpectedly; he was somehow spotted by a casting manager while he was waiting in line for one of the rides at a school carnival. Being just 12 years old at the time, and a newfound talent, Mike was cast in the action drama “Diplomatic Immunity” (1991), starring Bruce Boxleitner and Billy Drago, set largely in Paraguay. He then appeared in an episode of “Brooklyn Bridge” on CBS TV, and in a minor roll in the mystery film “Sunset Grill” with Peter Weller and Stacy Keach. His net worth was established. In 1993 Mike was cast in another film role, this time he appearing in David M. Evans’ “The Sandlot” – a comedy about baseball – next to Tom Guiry and Art LaFleur. Then in 1994 he was selected for the role of Luis Mendoza in the Sam Weisman`s film “D2: The Mighty Ducks”, with Emilio Estevez and Michael Tucker. He reprised the role in the sequel “D3: The Mighty Ducks”, released in 1996, in between appearing in an episode of “NYPD Blue” in 1996. Before he retired, he also made an appearance in one episode of the popular medical drama TV series “Chicago Hope” in 1997. Mike’s retirement from acting was apparently because he couldn’t see a significant career future in entertainment. Also, he matriculated form St Francis High School in La Canada that year, so needed to choose a career. Starting in 1996, Mike found job at Gerber Ambulance in Torrance, only to move to Los Angeles Fire Department in 1997, and become a full-time firefighter in 2002. Since then, firefighting has become his call, and the main source of his net worth. Regarding his personal life, Mike has been married to Kym since 2006; the couple has three children. According to reports, Mike is facing a possible four year prison sentence for assault, after an altercation with a man on Halloween 2015. 2 Worked for Gerber Ambulance in Torrance in 1996 as a stepping stool in the EMS to move on in his career as a firefighter. 3 He and older brother Pablo P. Vitar played the same character (at different ages) in The Sandlot (1993). 4 Is one of three children. He has an older brother Pablo (d. 2008) and an older sister Elizabeth.